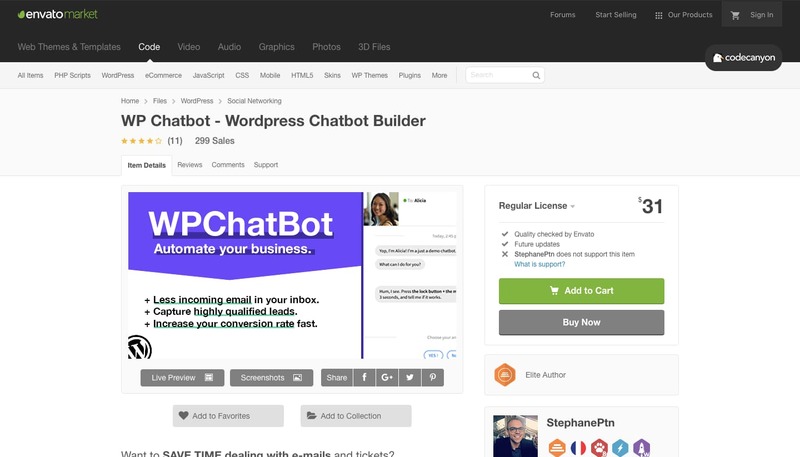 What Is a Chatbot - Should You Add One to Your WordPress Site? What Is a Chatbot – Should You Add One to Your WordPress Site? You’re probably already somewhat familiar with chatbots, or have at least seen one pop up in the lower right-hand corner of your computer screen while browsing online. But what exactly is a chatbot, and why are so many brands scrambling to add them to their websites? Keep reading to learn the answers to both of these questions, along with a few tools you can use to start using chatbots as part of your marketing and sales strategies. A chatbot is a computer program powered by either rules or artificial intelligence (or both!) that interacts with human users via a chat interface. For example, Pizza Hut has a Facebook Messenger chatbot that lets its customers learn about specials and promotions, then place orders for delivery or pickup. The bot mostly relies on multiple-choice menus and basic input to help customers, but is extremely user-friendly and serves its purpose of helping users place online orders effectively. And bots like this are only the beginning. In fact, Gartner predicts that over 85% of customer interactions will be handled without a human by 2020. So what’s causing this shift? One of the biggest reasons is that it’s in line with consumer preferences. 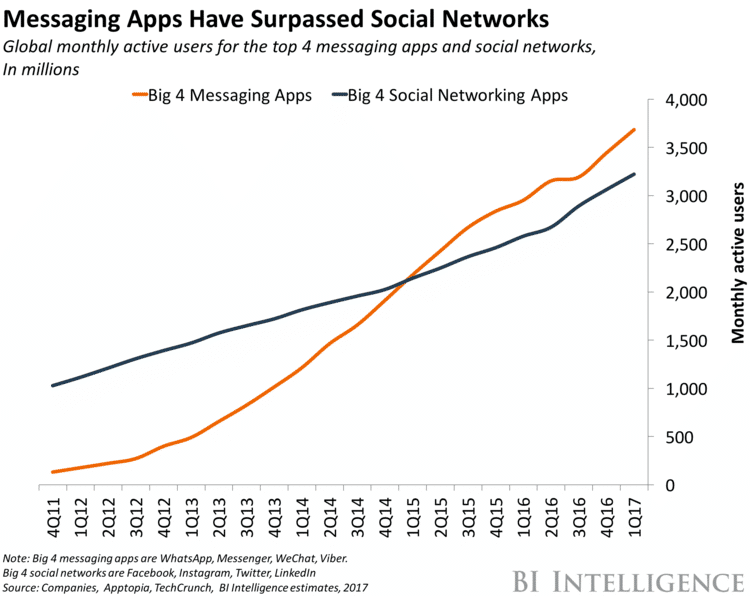 Messaging is now more popular than ever before, and the top four messaging apps worldwide have more monthly active users than the top four social media networks. Plus, the average open rate for private messages is 98%, which is almost five times the 20% average open rate for email. 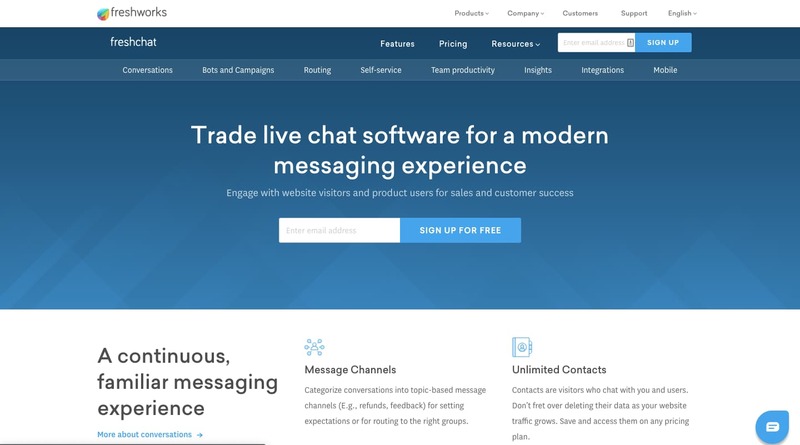 It’s clear, then, that people prefer to communicate through messaging interfaces. And this can go a long way in moving them through all stages of the customer journey. That’s especially true when you consider that 95% of visitors aren’t ready to make a purchase during their first visit. They might have some interest in the brand, but need more information and possibly answers to a few questions before converting. And in many cases, the company’s responsiveness to their questions can be the deciding factor in whether they ultimately convert. In one Harvard Business Review study, researchers looked at the average time it took for companies to respond to new prospects. They found that the longer it takes to respond, the less likely the company was to have a meaningful conversation with a key decision-maker. In fact, firms that contacted new leads within an hour were seven times more likely to have those meaningful conversations than those who did even an hour later. And unfortunately, many businesses aren’t responding nearly quickly enough to achieve the sales they want. Although 37% of companies responded to their leads within one hour, and 16% responded somewhere between one to 24 hours, 24% took more than 24 hours — and 23% never responded at all. From a consumer perspective, those response rates are unacceptable. 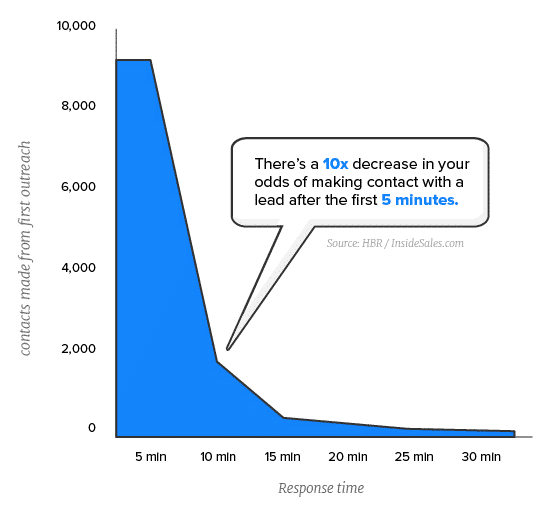 After that five minute mark, odds of making contact with a lead decrease 10x. 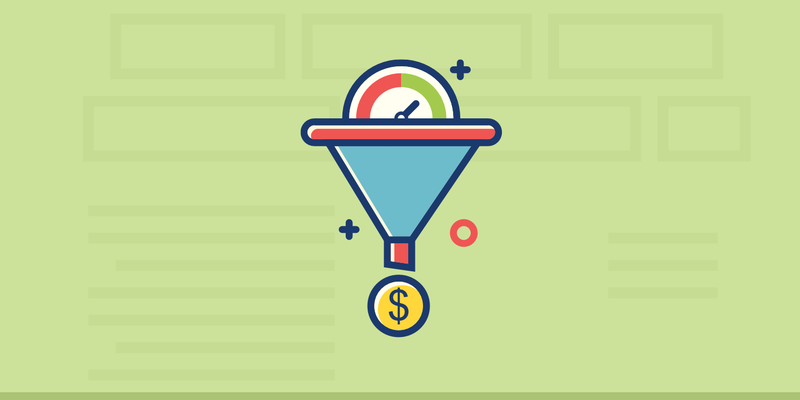 Now, if you run a lead-based business, you might be wondering how on earth you can expect to follow up with all of the qualified leads that fill out your website forms within five minutes. Even if you have the most dedicated sales team in the world, they likely don’t have the time to be checking your CRM for new leads that often. But just because this problem is common doesn’t mean you shouldn’t work to fix it. After all, 85% of B2B marketers say they aren’t happy with their results. So it’s clear that the status quo simply isn’t working for most. 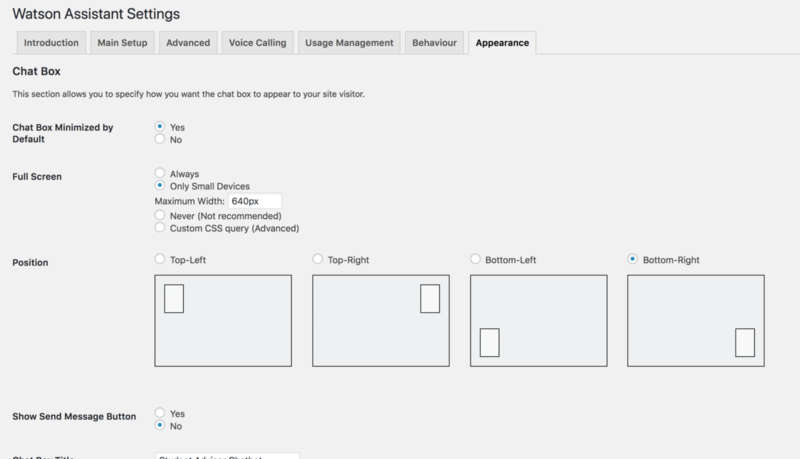 And some companies attempt to address this issue by adding live chat interfaces to their websites. In most cases, this channel is staffed by support agents that can answer simple inquiries and pass new leads on to the sales team when they’re available. But if you don’t already have 24/7 staff available to live chat with your customers, this can be a very costly solution to implement. And that’s where chatbots have the potential to be extremely valuable. 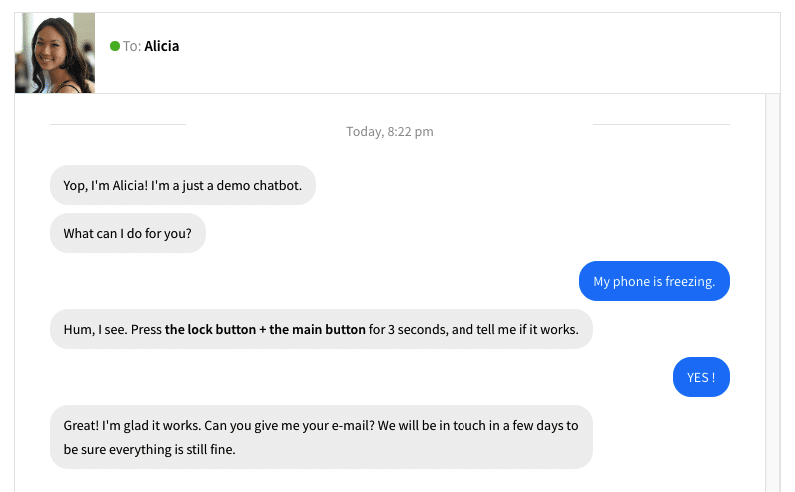 With a chatbot on your site, you don’t have to worry about your sales team being unavailable when new prospective customers and clients get in touch, and you don’t need to hire additional staff to keep up with a live chat interface. Instead, you can use chatbots to automate responses and direct visitors to the information they need within seconds. And they can do this at virtually every part of the customer journey. Today, chatbots can handle tasks ranging from referring visitors to information to qualifying new leads to scheduling meetings. And it should come as no surprise that visitors are more than willing to use chatbots for these tasks. In fact, one survey found that 40% of consumers say they’ll interact with a chatbot if it’s available on a website — making them the perfect tool for directing your audience to the information they need in order to convert. The most important goal for any lead-based company’s website is collecting information your sales team can use to contact new prospects. And chatbots are perfect for this purpose. 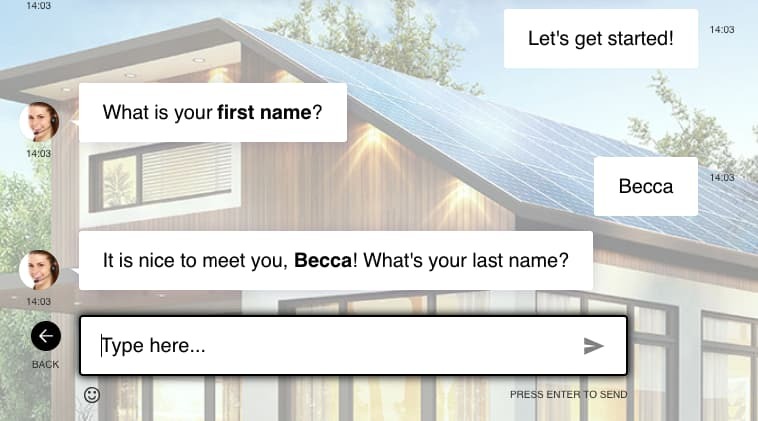 For example, 1ClickSolar uses a landing page with a full-screen chatbot to start collecting a visitor’s information as soon as they arrive. 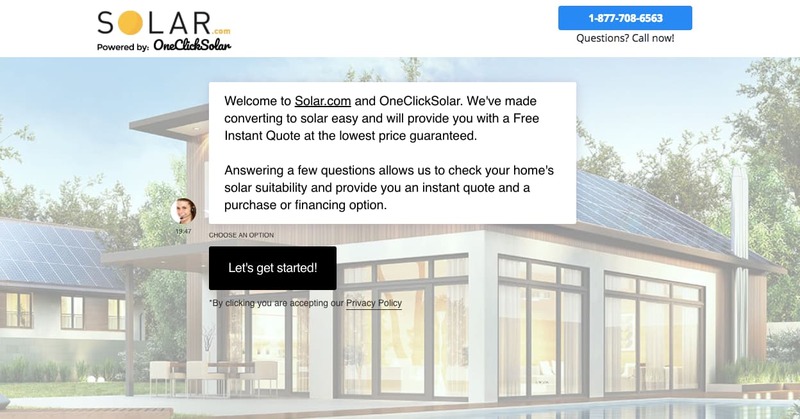 First, the bot tells the user that they’ll need to answer a few questions to verify that they’re eligible for solar installation and to receive a free quote. Then, after the user clicks “Let’s get started!,” the bot asks a series of questions to collect basic contact information. This process essentially collects the same information most sites attempt to collect through standard lead forms, but in a way that’s much more engaging for the user. From there, it asks for their zip code, address, type of roof, and monthly electric bill, in order to determine whether they’re a suitable lead for solar panel installation. After confirming all of these details, the bot provides a free quote as promised, and lets the user know when to expect a follow-up email from a sales representative to discuss their project in more detail — effectively getting the user into their sales funnel, and moving them closer to a sale. Collecting a steady flow of leads is challenging. But evaluating and responding to each of those leads is arguably even more challenging, especially for busy sales teams. But chatbots can simplify this process. In addition to collecting information about your leads, a bot can also identify high-quality leads and make them a priority for your team. 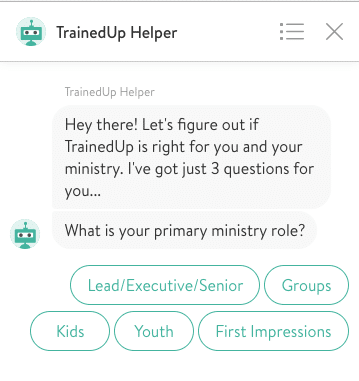 For example, ServeHQ is a video training service for church leaders. This means that their target audience is fairly niche, and their sales team wants to focus on engaging with leads that are likely to become clients. To help reach this goal, their site’s chatbot begins by asking three questions about the visitor’s role and interests. Then, based on their answers, it can assess whether each visitor is likely to be a qualified lead, and pass the most qualified leads along as top priorities. This enables their team to assist those high-quality leads as quickly as possible — and ideally even within that five-minute window. 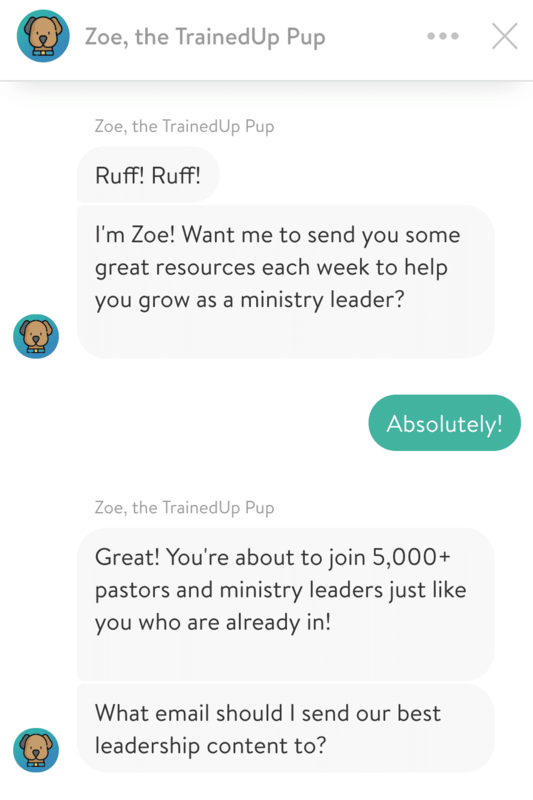 TrainedUp not only uses their chatbot to prioritize new leads, they also use it to subscribe people to their weekly newsletter. This could be a great alternative to push notifications. One of the most common misconceptions about chatbots is that they’re designed to replace human support staff and sales teams. But this isn’t the case at all. 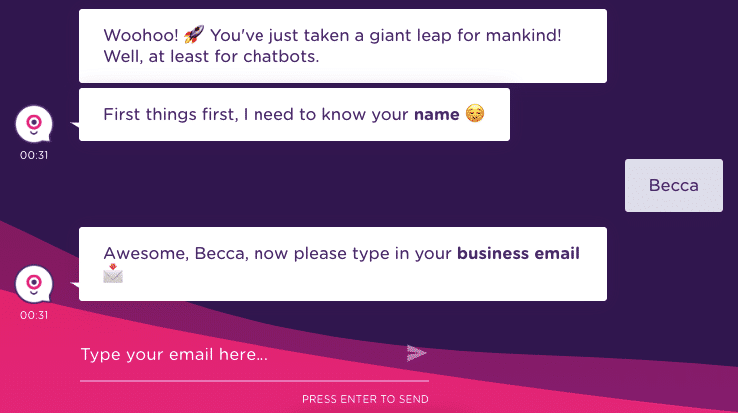 In fact, one of the best roles a chatbot can play on a website is a connection between your customers and your staff. 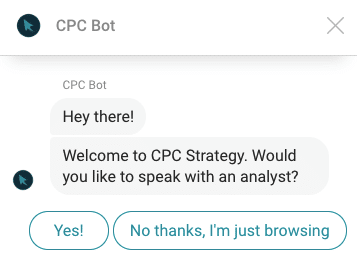 For example, the first question that CPC Strategy’s chatbot asks all of their visitors is whether they’d like to speak with an analyst. This way, if the visitor is ready to speak with someone who can help them determine whether the company’s services are the right fit, they can do so as quickly as possible. 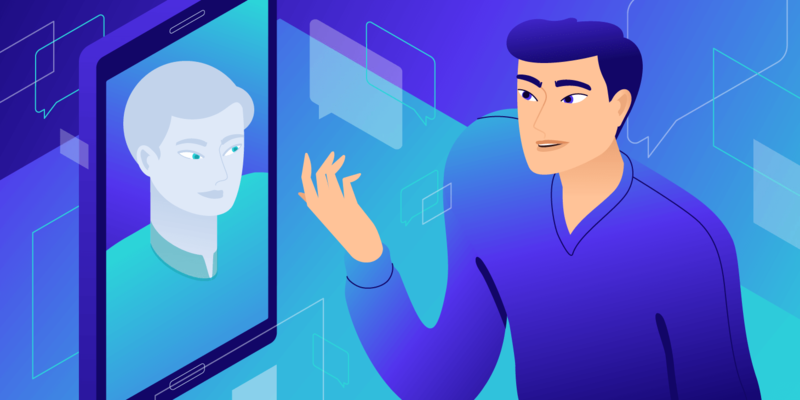 Plus, for companies with multiple customer-facing teams, a chatbot can also make sure that each customer is able to reach the one that’s best-suited to help them. 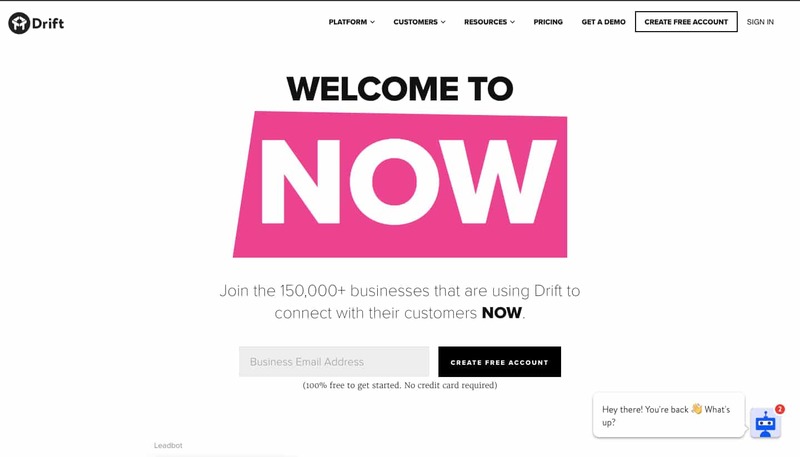 For example, Drift uses its Driftbot to automatically route visitors to the appropriate person for their needs. If a user reaches out and indicates that they’d like to speak with the sales team, it adds them to that team’s queue, then begins collecting the information that team might need to effectively assist them. This way, by the time a sales representative is available to speak with the visitor, they’ll have basic details like their contact information, interests, and budget, and can jump right into learning more about what they’re looking for. 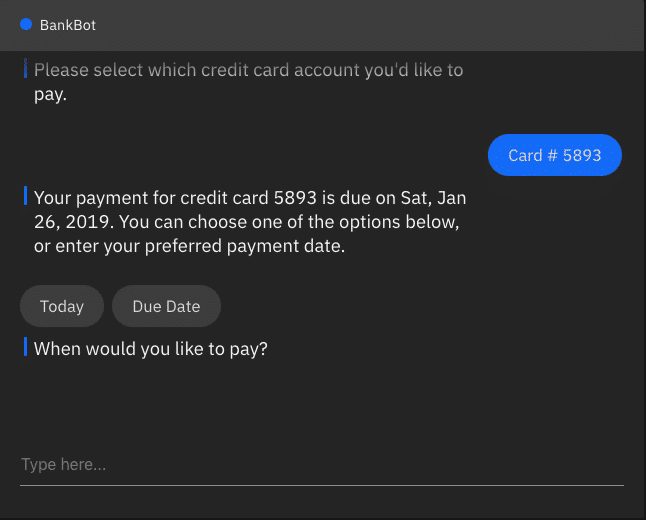 If the visitor indicates that they’re looking to speak with the customer support team, on the other hand, the bot can route the ticket to that queue instead, and collect details about the issue they’re seeking assistance with. If you’ve already invested in content for your site, there’s a good chance that you’ve published articles, blog posts, and tutorials that provide most of the information your customers need. And you can make the most of this content by “training” a chatbot to direct visitors straight to the resources that are relevant to their interests and questions. 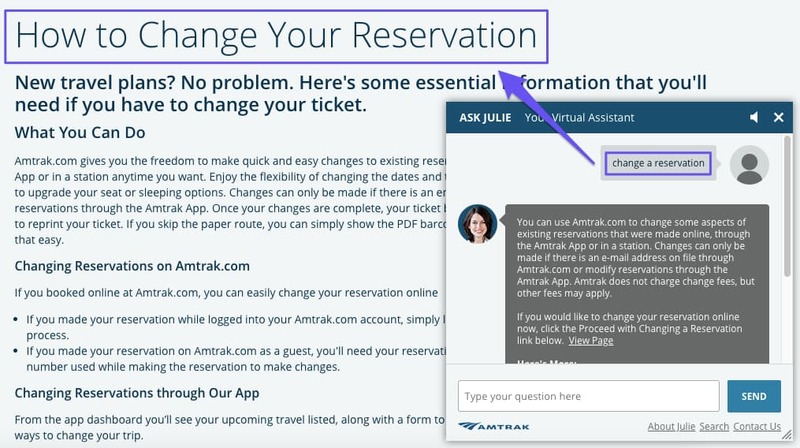 For example, Amtrak’s chatbot, “Julie,” is accessible in the top navigation bar of their site from every page. If a visitor asks a question that’s already answered on their site, the bot responds with a brief answer, along with links to more in-depth information. This way, they not only help users get the information they need, but also maximize the value they get from each of the resources on their site. If you’ve ever browsed a lead-based company’s website while considering contacting them about a project or service, you know it’s not always the most exciting or engaging experience. A chatbot can change this. 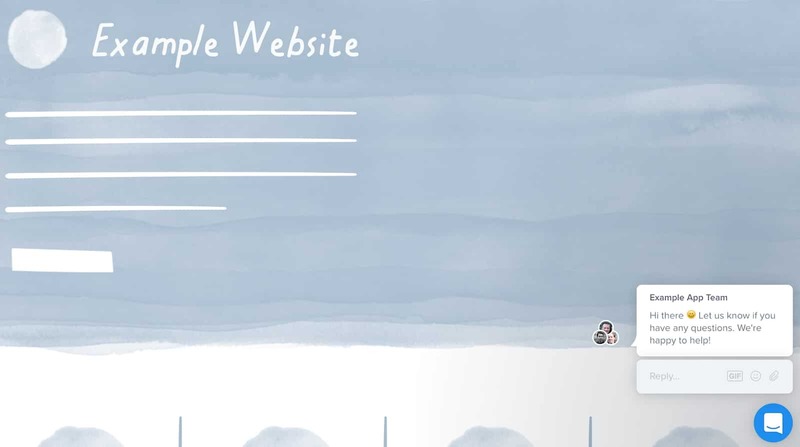 First, it can greet users in a way that’s more personal than a standard page of copy. From there, it can ask for details that enable it to tailor the “conversation” to individual users. For example, Landbot asks each visitor for their name, then addresses them by name throughout the rest of their interaction. And while this is a fairly basic example, it’s only the beginning. Chatbots can also tailor conversations to different segments of an audience, and even deliver information that’s specifically relevant to a visitor’s indicated interests. Many of the inquiries a service-based company’s support team receives are about details specific to their projects and accounts. In this case, directing visitors to a static website page won’t be enough to answer their question. But when integrated with the platforms you use to store and manage customer data, a chatbot can also provide customers with account information and other important details. 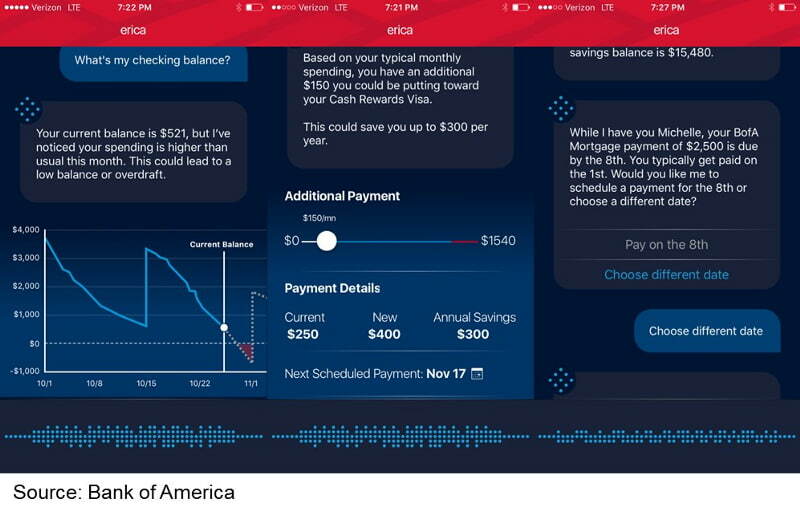 For example, Bank of America’s chatbot can tell customers their account balances and payment information, and even assist them with tasks like bill payment. This way, customers always have access to the information they want, even if a customer service representative isn’t available to assist them immediately. 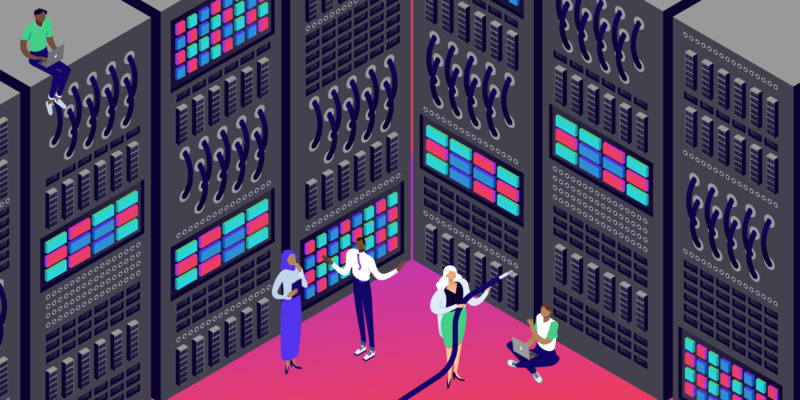 Many of the capabilities on this list, like qualifying leads and directing visitors to site resources, and typically handled by customer service teams. This means that by integrating a chatbot, you can eliminate these tasks from your employees’ workloads. Plus, if you integrate support-focused content, you can even eliminate basic support inquiries from your team’s queue. For example, this bot from WP Chatbot is equipped to answer basic technical issues and walk users through the process of resolving them. 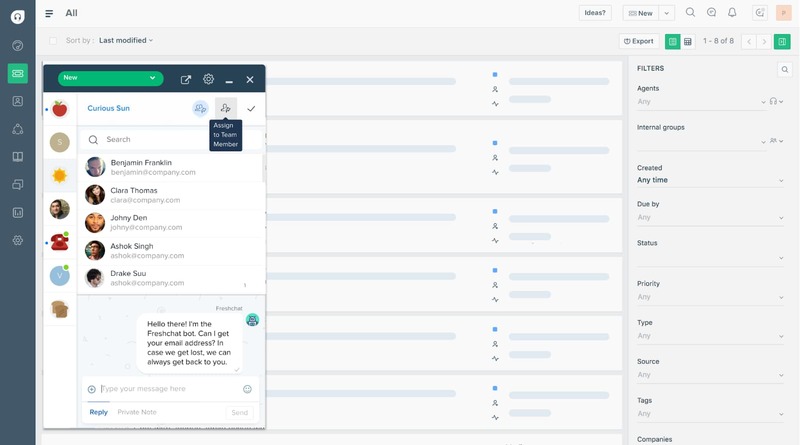 When a bot is able to handle these straightforward inquiries, they’re eliminated from your team’s workload — enabling them to focus on more complex, important tasks, and assist your customers even more efficiently. If you’re interested in adding a chatbot to your site, the first step is choosing a platform on which to build it. Fortunately, there are several great options that integrate seamlessly with WordPress sites — and these eight are some of the best. And installing it on your WordPress website is easy. 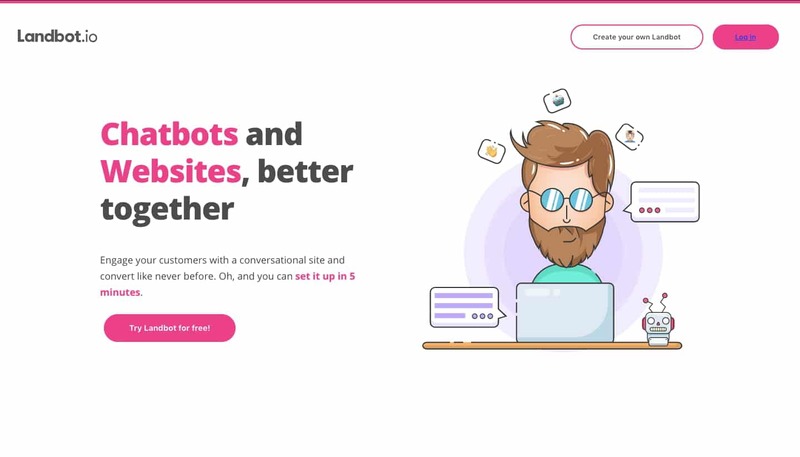 Drift is another well-known chatbot platform that integrates easily with WordPress sites. 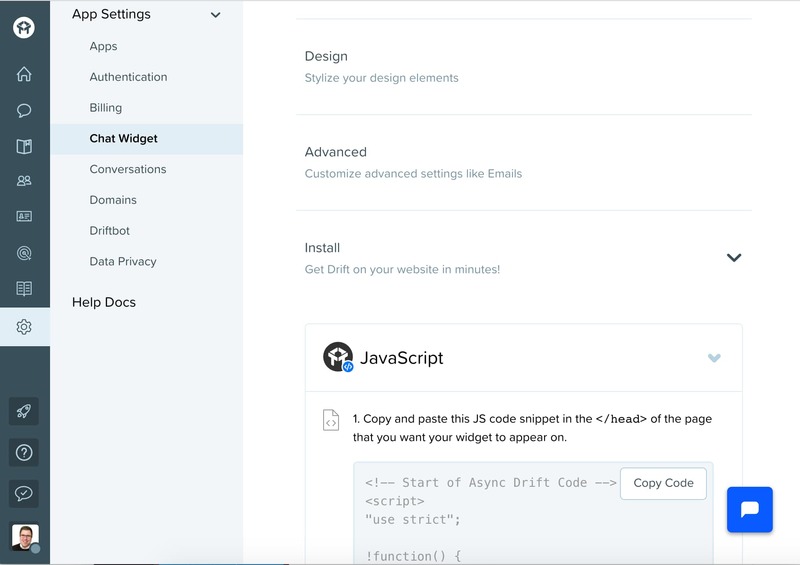 After creating an account, users can simply install the platform’s plugin, then copy and paste a line of widget code from their account into their site’s header. Then, enable the widget, copy a few lines of code into the plugin settings, and save changes. As soon as you’ve completed this process, your chatbot can be up and running (and collecting leads) instantly. WP Chatbot is an extremely user-friendly platform that makes building and installing chatbots a simple, straightforward process. 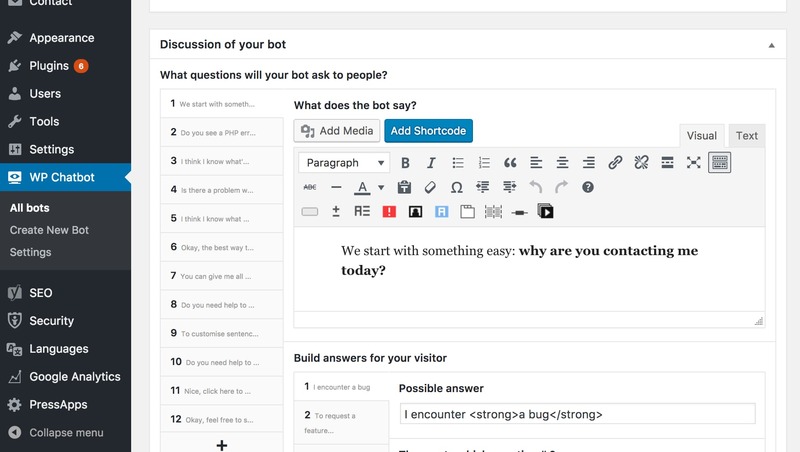 Using this plugin, you can give your bot an “identity” and personality, teach it what to say to visitors, and incorporate questions that enable it to collect leads on your site. You can also create multiple bots for different purposes, like sales or support, depending on how you want to use chatbots in your strategy. Plus, all chatbots are fully customizable with CSS, so they can be designed to be visually compatible with the rest of your website. 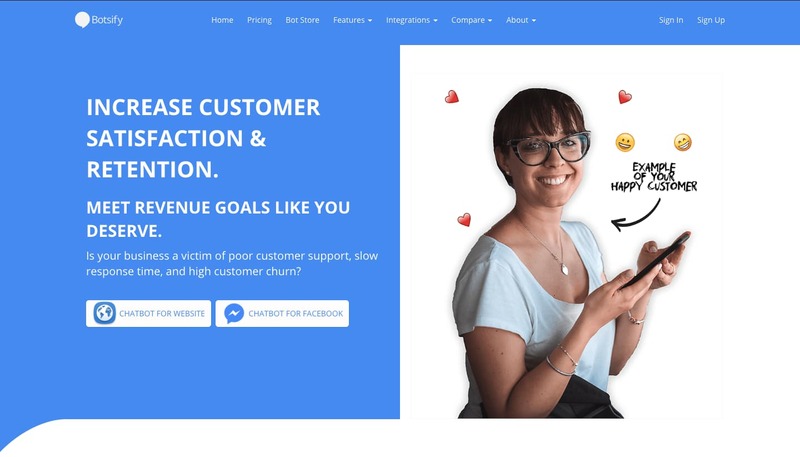 Freshchat is a customer support live chat platform that also allows its users to create bots within its live chat interface. Users can create fully customizable bot workflows, tailored to their site and marketing goals. Because the platform is designed to assist visitors site-wide, different bot conversations can be categorized based on topics like feedback, sales inquiries, support requests, and anything else a bot might assist with. 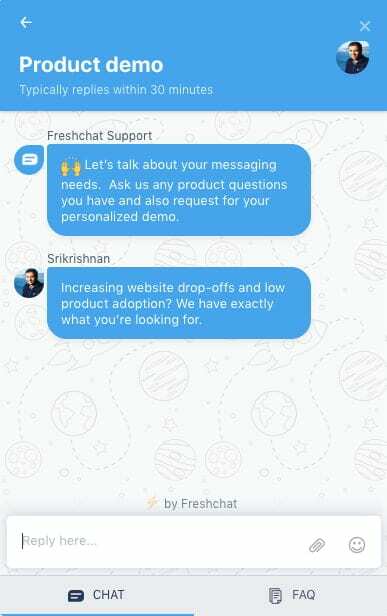 Plus, the Freshchat Messenger can be used not only as part of your website and app, but also as a standalone support portal. If a visitor is looking for information on a specific topic, they can use this interface to jump straight to relevant content. This helps solve problems faster without the need for you to have live agents on call at all hours. And if they don’t find what they’re looking for, the chatbot can convert conversations into support tickets. Then, each of these tickets is passed along to support or sales staff, so that the visitor can get the assistance or answer they need. Landbot is a chatbot platform that aims to help businesses create “conversational experiences” with their site visitors. And installing their chatbots on a WordPress site is easy. First, use the platform’s builder to generate code for either a full page, popup, embedded, or live chat interface. After activating this plugin, you can continue to update and improve your chatbot with the Landbot builder, and see your changes reflected on your site automatically. IBM’s Watson Assistant is an offering for building conversational interfaces into any application, device, or channel. 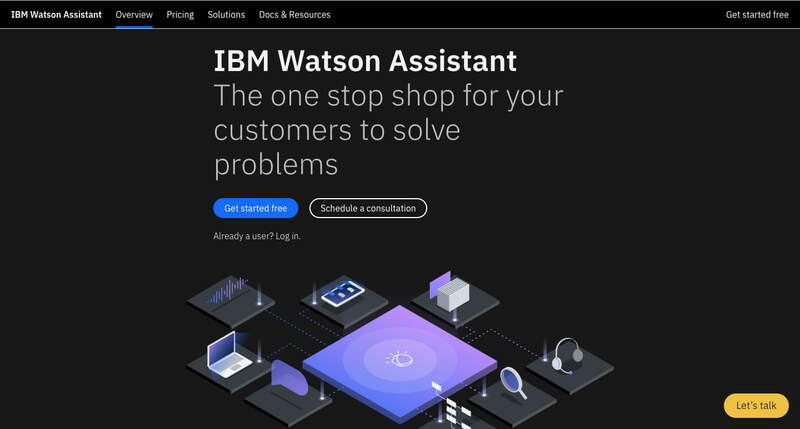 While most chatbots today use relatively simple multiple-choice style menus to help visitors find information, and basic question-and-answer style setups for collecting lead information, Watson Assistant is powered by artificial intelligence. It comes pre—”trained” with information about certain industries, and can utilize user input to help them accomplish a wide variety of tasks. 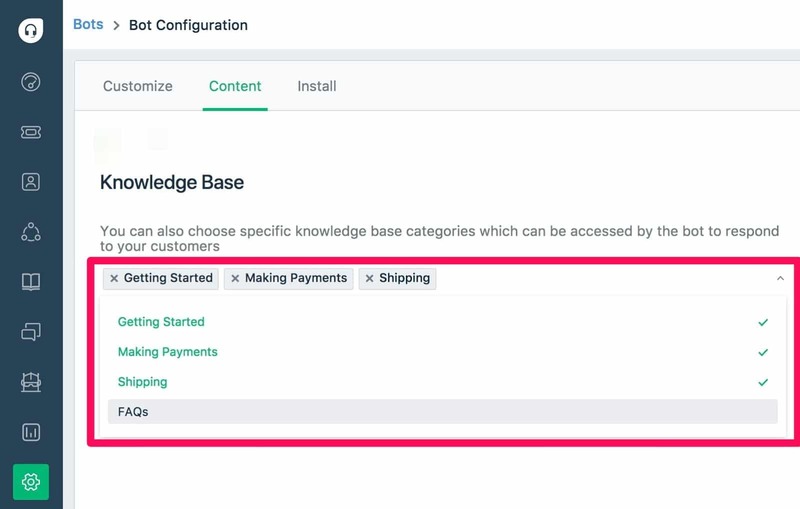 And adding this chatbot to a WordPress site is as easy as installing the Watson Assistant plugin and customizing the settings to match your preferences. These settings let you customize the look and feel of the chat interface, so that it displays the way you want on your site. Botsify is a popular option among site owners that are just getting started with chatbots. That being said, it’s not the most user-friendly in terms of WordPress integration, as this step has to be done manually. We recommend checking out our tutorial on how to add code to your WordPress header and footer. Lastly, there is WP-Chatbot. This is designed specifically to use with Facebook Messenger Customer Chat. If you’re familiar at all with PPC or internet marketing you’ve probably heard of the company WordStream. 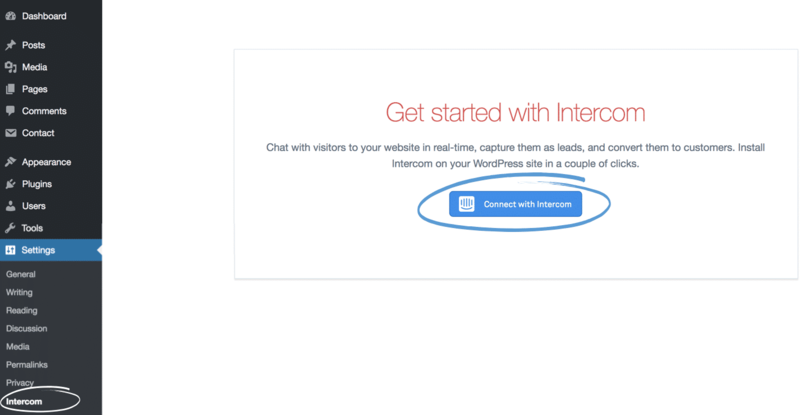 Larry Kim, the original founder of WordStream, is now the CEO of MobileMonkey, the company that develops this plugin. He knows what we call the “chatbot scene” very well! This is definitely one you’ll want to check out. 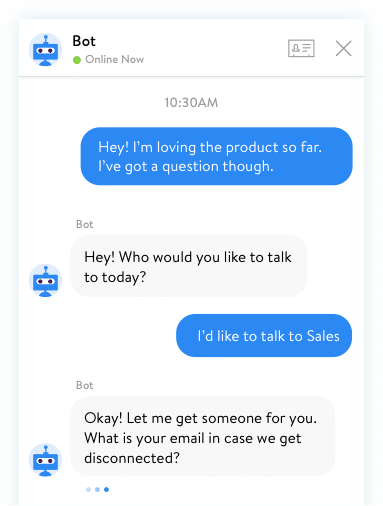 Chatbots are still a relatively new addition to the options brands have for engaging with potential customers and clients — but many companies are already seeing the benefits of incorporating them into their sites. That’s because using a website as an effective sales tool requires offering fast responses and assistance whenever your audience needs it. Chatbots can deliver this 24/7. 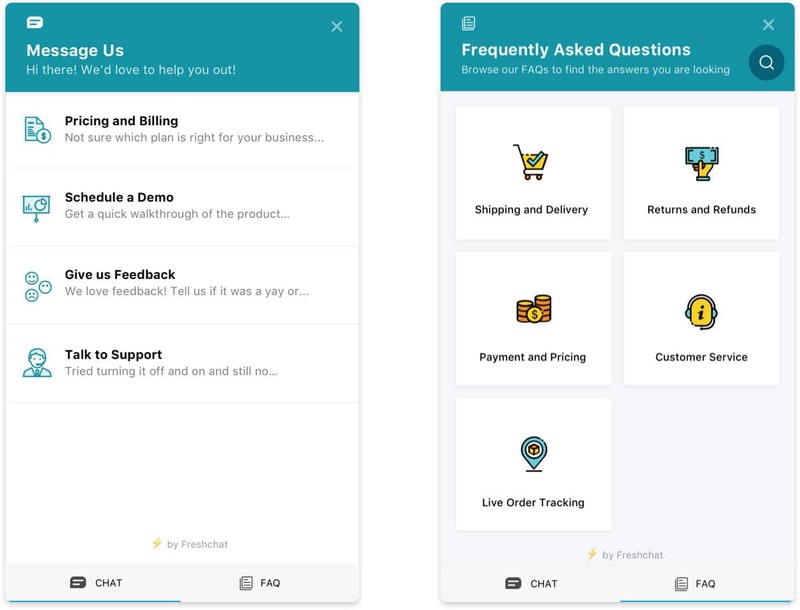 They can address users questions and needs within seconds, and direct them to the right person when they require assistance from sales or support staff. This makes them extremely effective for collecting and prioritizing leads, directing visitors to helpful resources, personalizing the browsing experience, and even reducing employee workloads by handling all of these tasks. 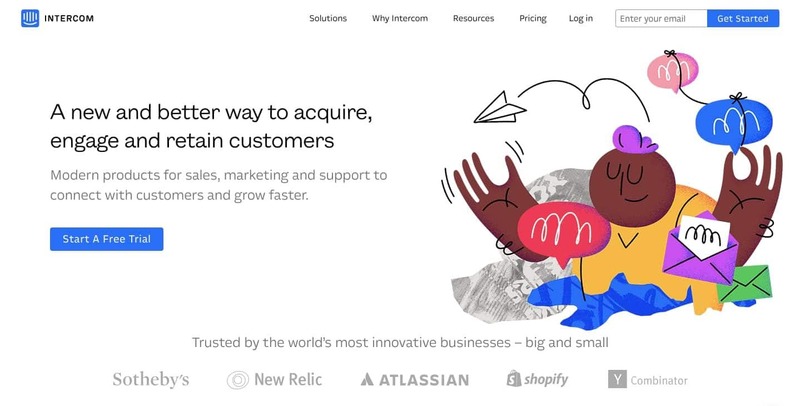 And although chatbots used to only be a viable option for businesses with the budget and developers to build them from scratch, there are now plenty of options that make integrating one into a WordPress site a breeze — making this an addition worth considering for any company. Thank you very much for this article, I’m adding a Chat Bot right away!